Good news is worth sharing! 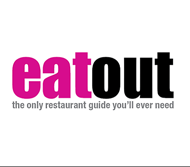 We are honoured to announce that Restaurant Mosaic has been nominated as one of the Top 20 finalists for the 2016 Eat Out Mercedes-Benz Restaurant Awards! 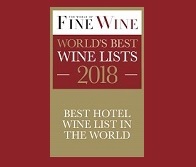 The Top 10 restaurants in South Africa as well as the winners of the coveted Eat Out S.Pellegrino Acqua Panna Chef of the Year, Eat Out Nespresso Service Excellence Award and the Eat Out Wine Service Award will be selected from the 20 nominees and announced at the awards ceremony in Cape Town on Sunday, 20 November. 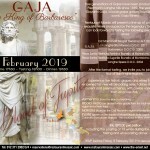 – A GOURMET TASTING EVENT WITH CARL SCHULTZ! Situated on the picturesque Stellenbosch Wine Route, to the north of Stellenbosch in a free-draining valley of the influential Bottelary Hills, Hartenberg Wine Estate is at the forefront of the new era of South African winemaking and has produced numerous award winning wines under the guidance of winemaker Carl Shultz (also a member of the Cape Winemaker’s Guild). 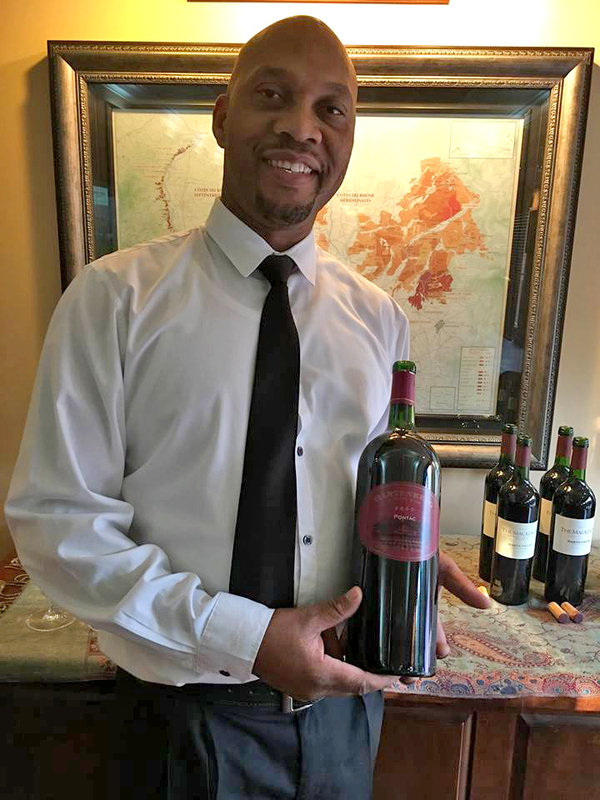 We were therefore honoured to welcome Carl to Restaurant Mosaic for a Gourmet Wine Tasting of some of Hartenberg’s most illustrious and famous wines! 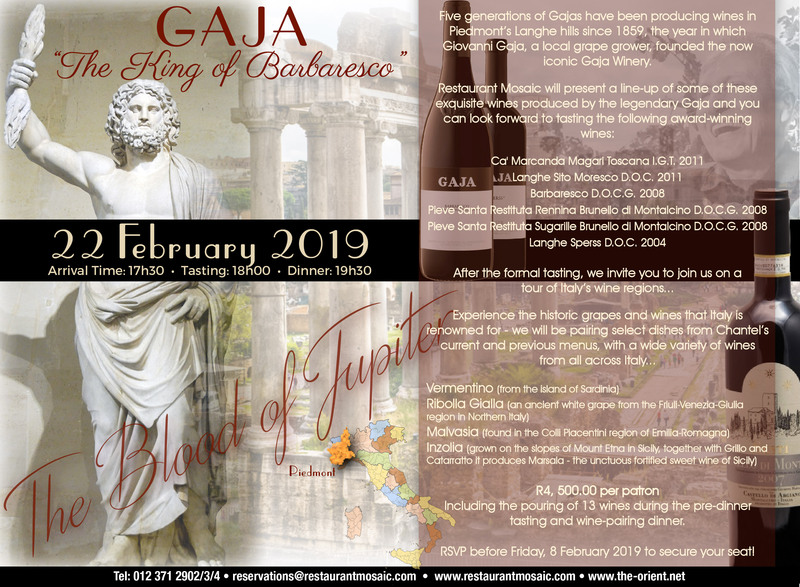 With our esteemed sommelier also having a surprise in store for acclaimed winemaker Carl and our loyal patrons, as well as a wine in the lineup that is not in existence anywhere else in the world anymore, this was an evening not to be missed! 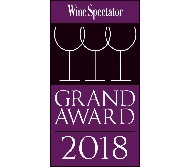 First up was the Gravel Hill Shiraz 2010, the name is derived from one particular site that has very little soil in an ordinary sense; the vines are planted on ferrous stones some 40 to 50 cm deep above a bed of clay. Full-bodied the Gravel Hill Shiraz 2005 followed with great poise. The Mackenzie was up next and pays homage to the Mackenzie family that headed the development of the new era at Hartenberg Wine Estate. 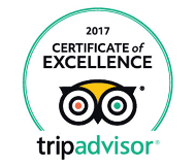 The 2011 has been awarded with Platter’s five-star rating three times! 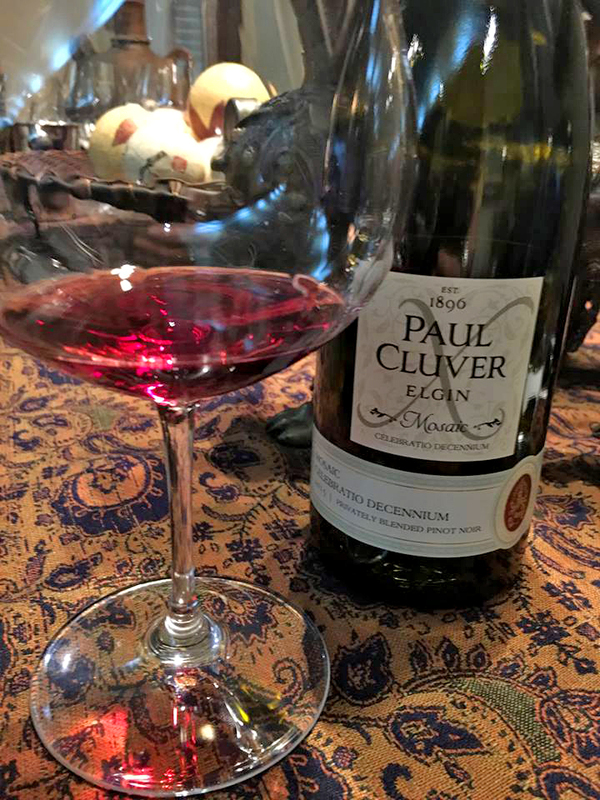 Carl describes this classically styled, richly structured wine as displaying strong blackcurrant notes, as well as violets and dark chocolate aromas. This limited volume wine represents a vineyard parcel selection of the very best Cabernet Sauvignon and Merlot planted on rich, deep red Tukulu soils. 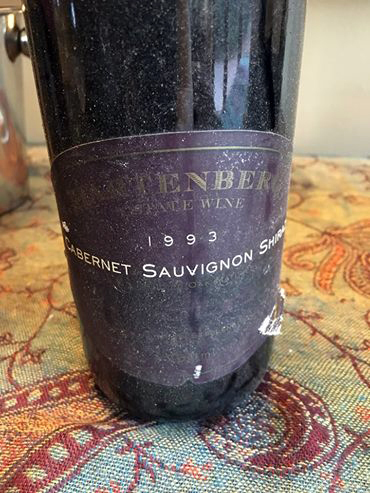 Then came Germain’s first surprise for the evening – our very last bottle of the Hartenberg Cabernet Sauvignon/Shiraz 1993! When Carl joined the Hartenberg team as the cellar master and winemaker extraordinaire in 1993, this was just one of the 17 different wines that was produced by the farm at that time. 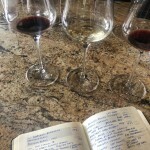 Since then Carl has refined the wines produced to a mere eight. Still incredible with lovely peppery, spicy and blackberry notes on the nose and silky soft tannins. 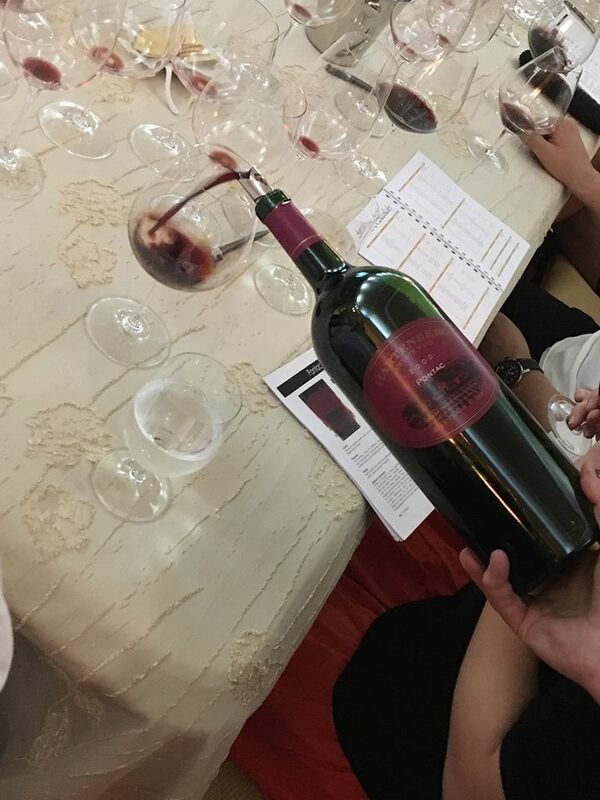 Lastly, we concluded our tasting with a magnum bottle of the very rare Pontac 2000! This cultivar is no longer available anywhere in the world and Hartenberg also pulled up their last Pontac vines after the 2000 vintage. We were privileged to share one of the very last bottles left in the entire world! A forthcoming nose of mulberry jam, plums and prunes with a fresh acidity and lots of fruit on the mid-palate… a true legend! 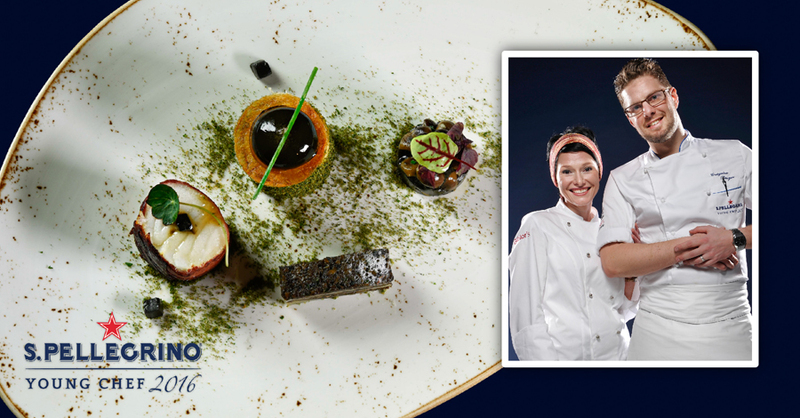 S.Pellegrino Young Chef in Milan was an amazing experience and we are proud to have been part of such a high-level competition. Even though Grégoire did not win, it was four incredible days of cooking aside incredible chefs from all around the world and the experience was worthwhile and beneficial for both of us. 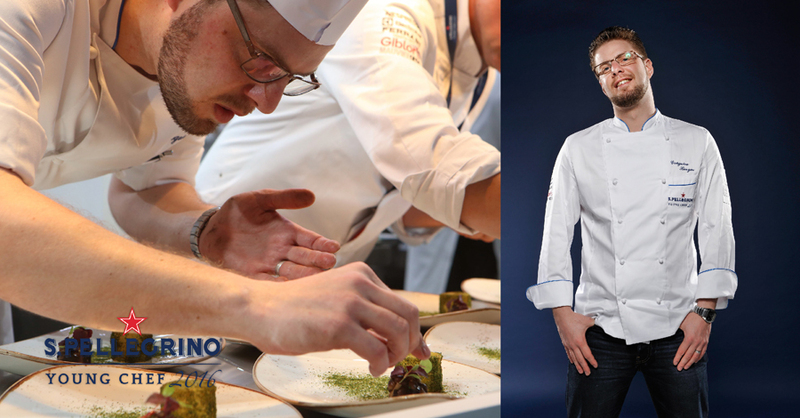 Congratulations to young Chef Mitch Lienhard and his mentor Dominique Crenn from the USA, Daniel Nates from Mexico who won the “Inspiring Message Award by S.Pellegrino” and Alessandro Salvatore Rapisarda from Italy who took home the “Acqua Panna Contemporary Tradition Award”. You will not find these rare items in the high street shops of Milan, or at the tourist spots around the Duomo or the Galleria Vittorio Emanuele II. 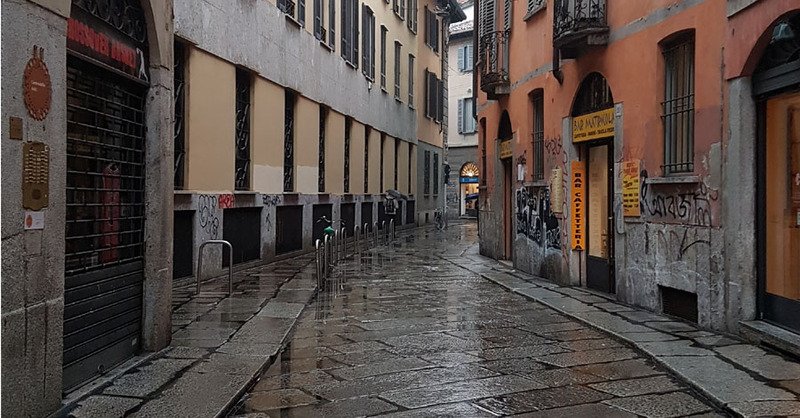 Tucked away in the small alleys of Milan, you must search for and discover the quaint little speciality shops that were entrusted, for so many generations, with selling this liquid “black gold”. 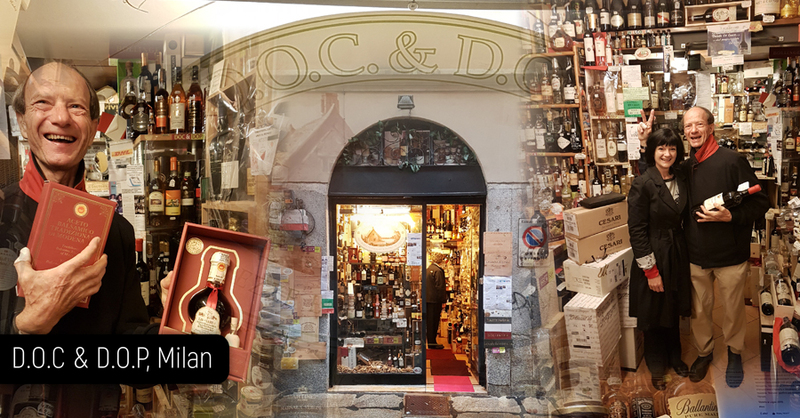 One of these little shops is DOC & DOP, where owner Aldo welcomed us with much excitement and exuberance. What a gem! The shop is filled with wonderful olive oils, aged balsamic vinegars and rare wine. 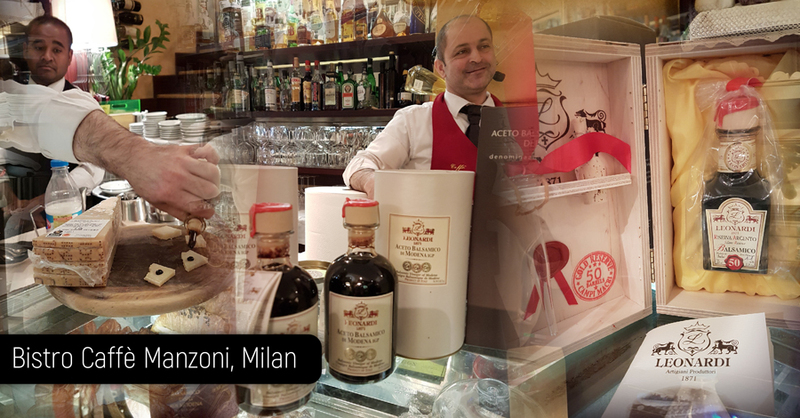 With careful selection and Aldo’s recommendation, we discovered some of the best Aceto Balsamico Tradizionale. The second treasure trove of gastronomy we visited was Bistro Caffè Manzoni, where we tasted balsamic brewed five generations ago – dark and glossy with a velvety texture and a rich complex taste… there is but one distinctive taste of this delectable rarity in the world. We were in awe with the selection of superb balsamic they had on offer and the Mosaic Team left with an outstanding selection of carefully aged balsamic, amongst other, a rare 100 year old balsamic that were first put in a small cherry wood barrel shortly after the new year celebrations of 1900. Very happy and with a satisfied shopping day behind us, we retired to our hotel to carefully pack these rare gems for our trip home. The authentic traditional artisan balsamic vinegar can only be made and produced in Modena and is not produced from wine, as most vinegars, but from cooked grape juice. Adhering to tradition, the grapes must be locally harvested and is usually red and white grapes like Lambrusco and Trebbiano. The juice is then aged by a long and slow vinegarization process through natural fermentation, normally for between 6 to 45 years. On rare occasions the aging process can take several more decades, even generations and this is when the precious liquid is transformed into something extraordinary. Its progressive concentration is reached by aging in a series of barrels, sometimes up to 100 years old, made of different types of woods and without any addition of spices or flavourings. Even the bottle it comes in is trademarked, and the producers themselves are not allowed to do the bottling. 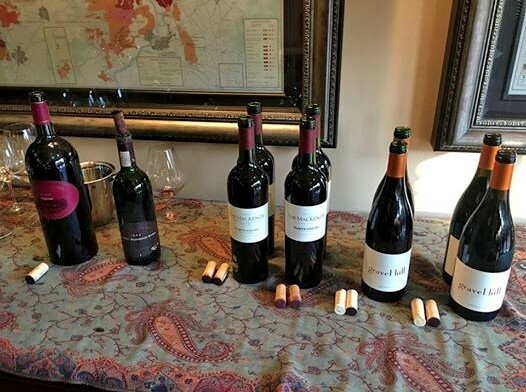 We are thrilled to bring some of these rarities home, for our guests to enjoy during our celebrations of Mosaic’s ten year anniversary… Come and experience a taste you will remember for the rest of your life. These are the seven gifts of God to man according to the old shield of the Clüver knights. At the Paul Cluver Estate in Elgin they still live by these virtues. This family-owned, family-run wine business is located in the cool-climate Elgin Valley, approximately 70km south-east of Cape Town. 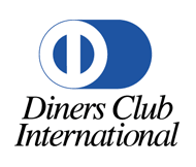 The property has been in ownership of the Cluver Family since 1896. Central to the success of the wine and farming business is the Cluver Family – a close-knit group with a visionary, pioneering spirit. Four of the five Cluver siblings are currently involved in the business, taking over the reins from parents Paul and Songvei. Paul Cluver IV is the managing director, Liesl is the marketing director, Inge the financial manager and Karin is the production manager (orchards). Their award winning winemaker, Andries Burger is married to Inge and is also the Chairperson of the Cape Winemakers Guild. 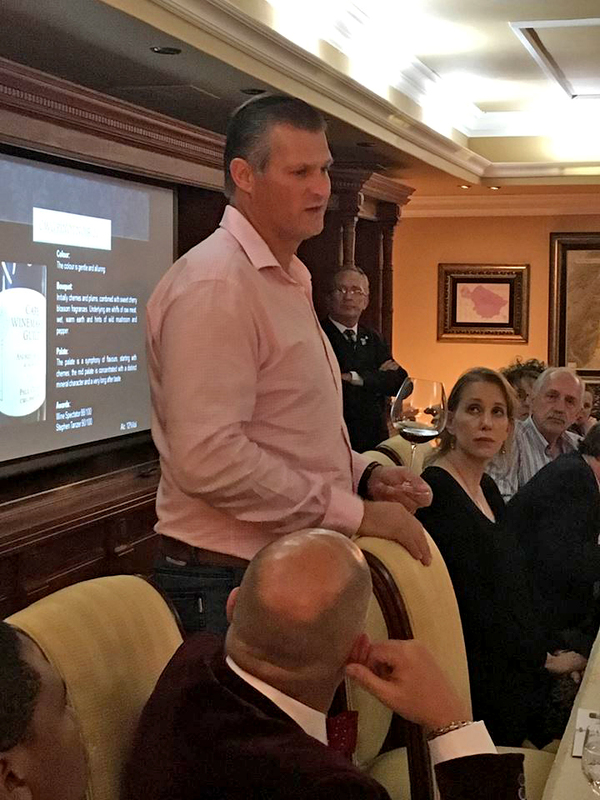 Early in 2015 our Cellar Master was successful in our bid for “The Godfather” Lot by Paul Cluver at the annual AfrAsia Bank Cape Wine Auction. Part of this exclusive lot also included a rare collection of 60 bottles of Pinot Noir blended personally for Mosaic by Andries himself. 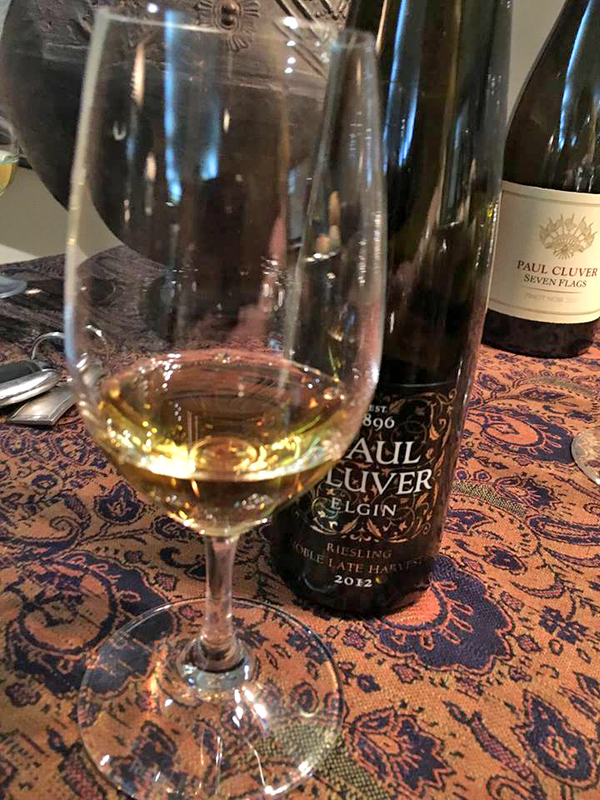 This special Paul Cluver Mosaic Barrel selection was finally ready and Andries uncorking the first bottles with us to pour for our guests! What a wonderful start to an already amazing tasting event! A lovely pale colour with beautiful open and fresh nose! Smooth and well-balanced with a lingering finish! Simply astonishing! 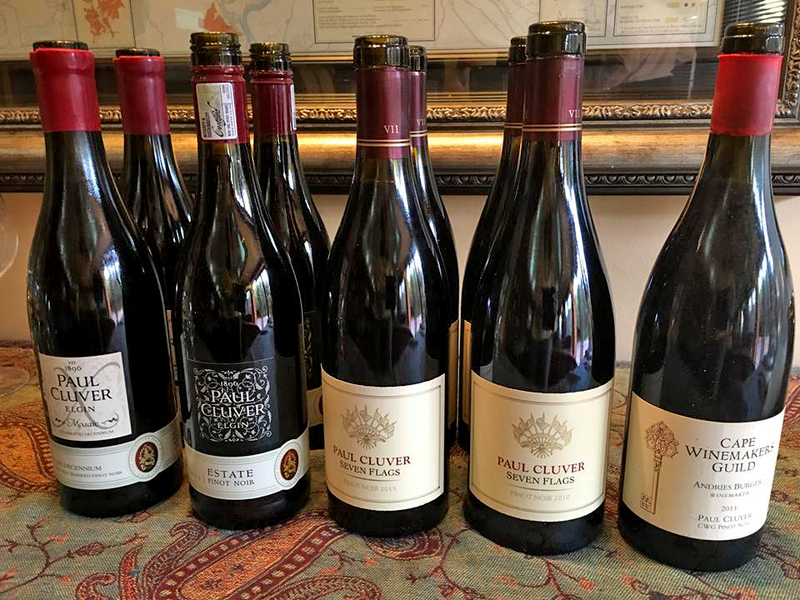 We began the official tasting with the Pinot Noir 2013, the entry level “village” wine from Paul Cluver and stepped up to the more complex Seven Flags Pinot Noir, where we compared two vintages – the 2010 and 2013. Spicy and smoky wines with a rich, ripe berry complexity. These are layered, deep and dense yet almost ethereally light and delicate. Limited release, barrel selection of Pinot Noir representing the best the vintage has to offer. Only 300 cases made each year. 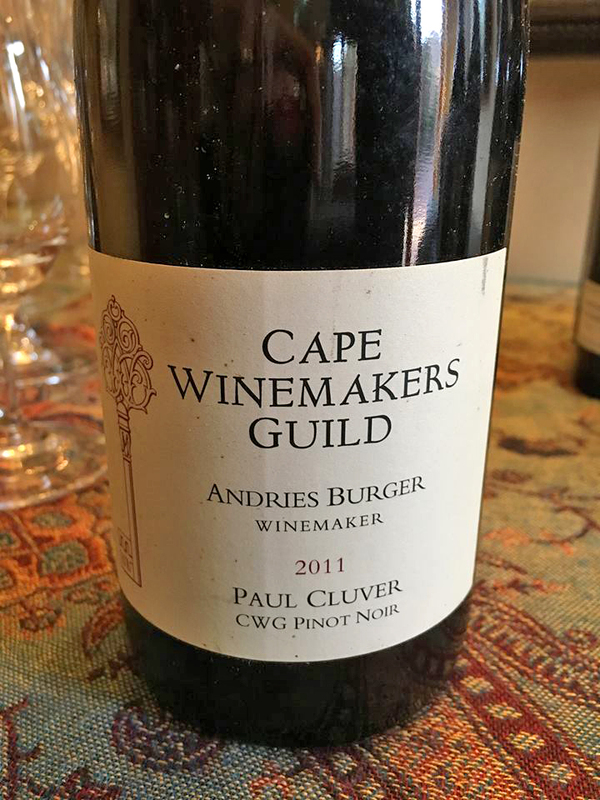 Andries’ 2011 Pinot Noir for the CWG was alluring with cherries, plums and cherries and sweet cherry blossom fragrances. The texture is where the power of this wine lies and the integration of oak adds to its finesse. 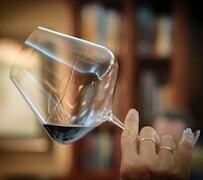 The mid-palate is concentrated with a distinct mineral character and a very long after taste. We concluded the tasting with the honey coloured Riesling Noble Late Harvest 2012. It was packed with apricot, spice and honey and the mouth-feel was full and impressively rich but with superb balance, the result of an elegant Riesling acidity. The perfect ending to a wonderful evening! 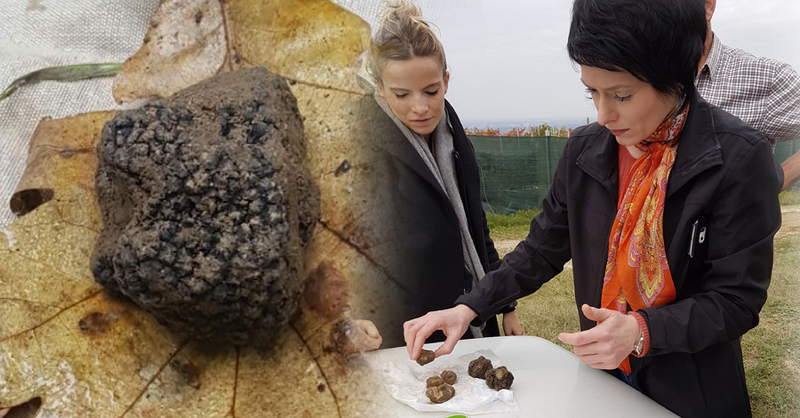 There are numerous advantages to visiting Italy in Autumn, but for me the most exciting of all is that this is the time for the famous White Truffle hunts to start. 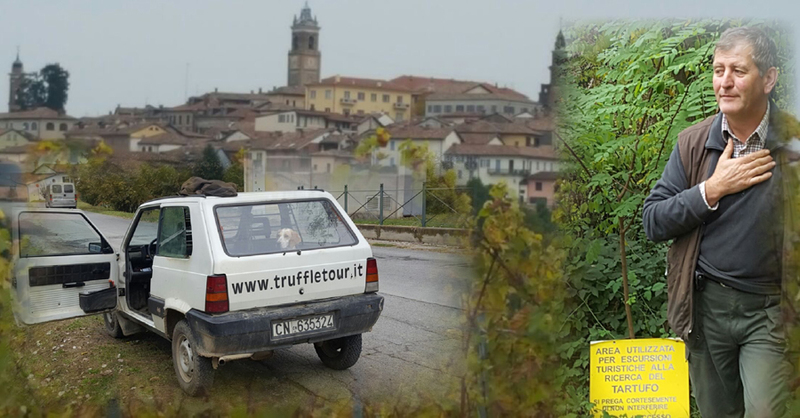 To take full advantage of this magical season we decided to head to the region of Asti in Piedmont where in the very small hilltop village of La Morra (mostly known for their wonderful wines) we were met by our guide and translator, Sylvia. As we drove towards La Morra I could hardly contain my excitement. 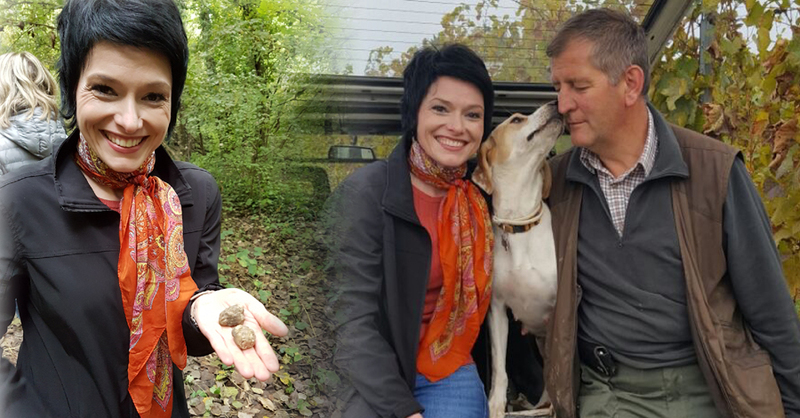 For the first time in my life I would have the opportunity to go truffle hunting with a professional truffle hunter – Marco Varaldo along with his specially trained truffle hound, Lila. 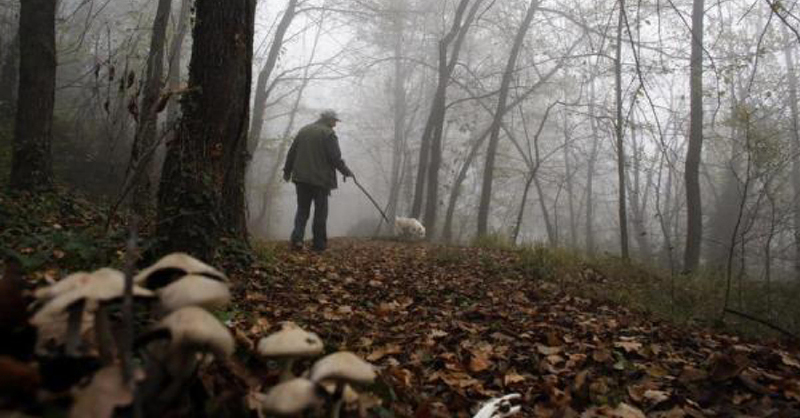 Yes, you have not misread – truffles are actually “hunted” by specially trained dogs because of their acute sense of smell. 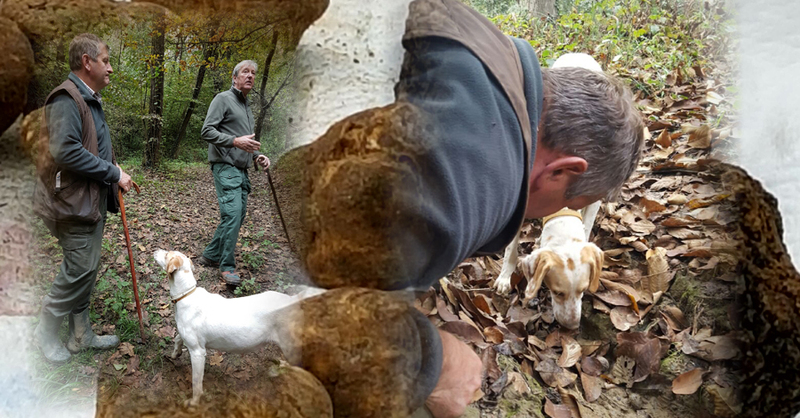 It was magical walking in the woods knowing that they are filled with these prized jewels of the culinary world, seeing first-hand the close bond between the truffle hunter and his canine companion. 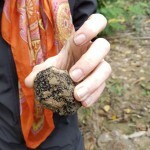 After only a short trek, Lila excitedly indicated that she had picked up the scent of one of these exotic jewels deep beneath the soil and carefully started digging, indicating to Marco where he needed to extract the truffle from between the roots and soil. 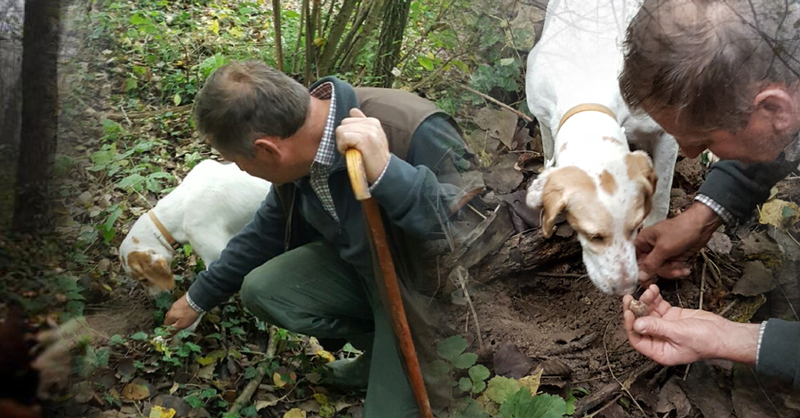 I can’t quite describe the feeling of excitement – the rare experience to participate in such a hunt, seeing in person the close bond between the master and his hound, the excitement when she discovers something underneath the thick carpet of leaves and him lovingly rewarding her for every discovery. 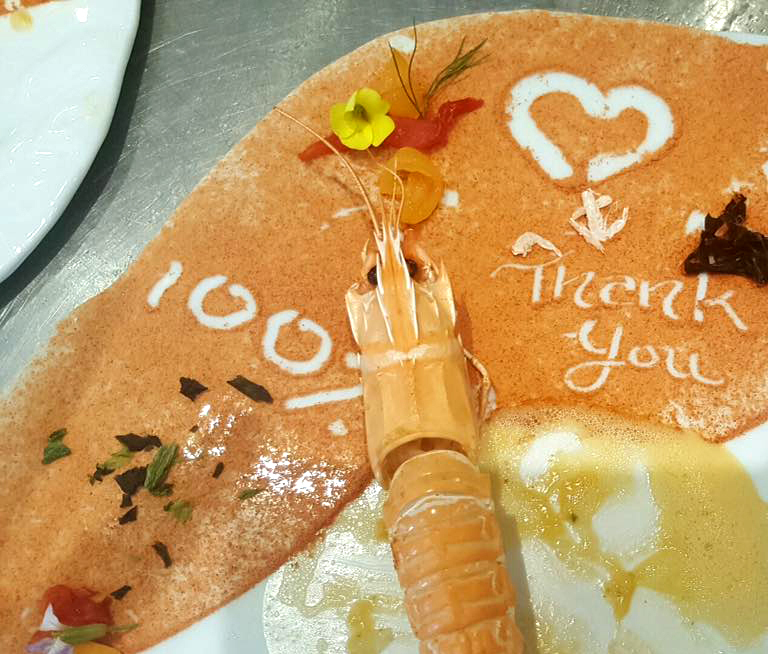 The first reaction from our guests who enjoyed our 10 year Celebration Menu. 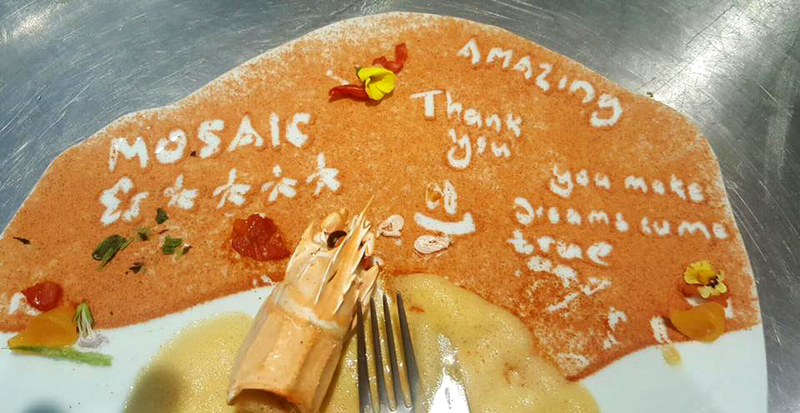 What was your favourite dish at Mosaic over the past 10 years? 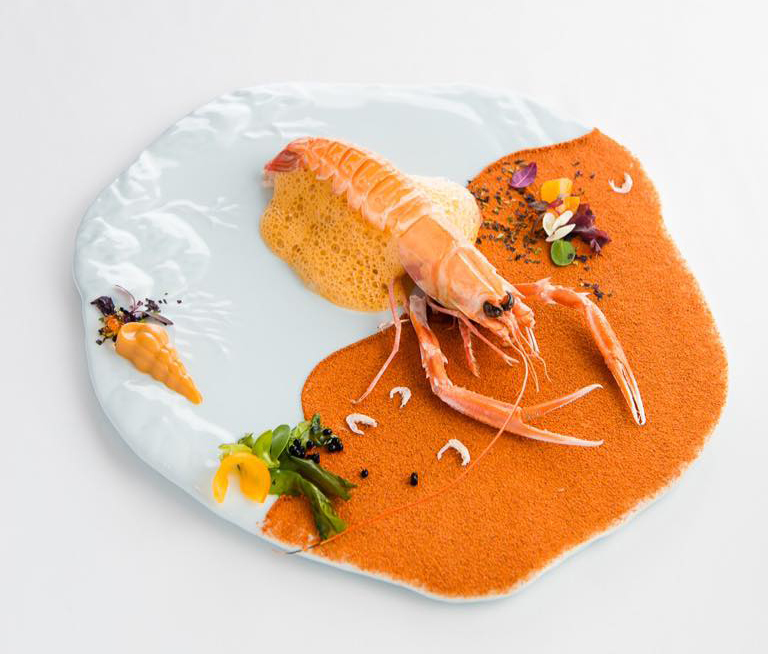 One of the biggest influences in my life as a chef, is chef Michel Bras, who could be found sketching the curves of his beloved hills in Aubrac, France on a clear plate of glass to simulate later in plating a new dish. 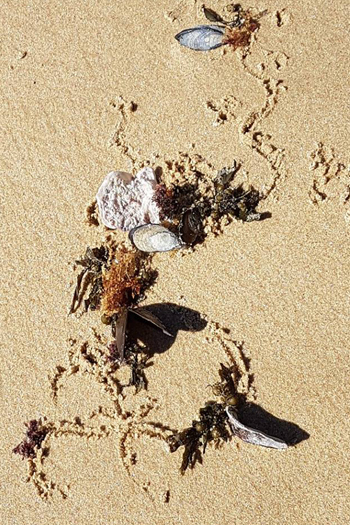 Similarly, I find my own inspiration from nature, discovering beautiful designs in jewels from the sea, deposited in the tidal pools of our own little paradise in the Southern Cape. 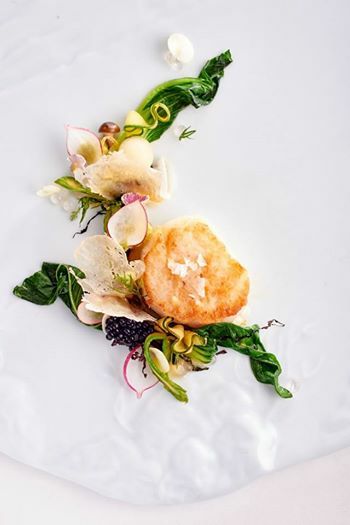 In redesigning one of Mosaic’s old favorites for our ten year Celebration Menu I found this new design and my creation “By The Seashore” evolved into a brand new plating – hoping that you all will enjoy it as much as I do. Nita Spilhaus moved to Cape Town in 1907 from Lisbon and this introduced her to the wealth of artistic subject matter in South Africa. She felt a fascination with, and delight in, capturing the shape and nature of trees. Artist Pieter Wenning was a close friend of Spilhaus and his influence can be seen in her use of colour and clean lines. 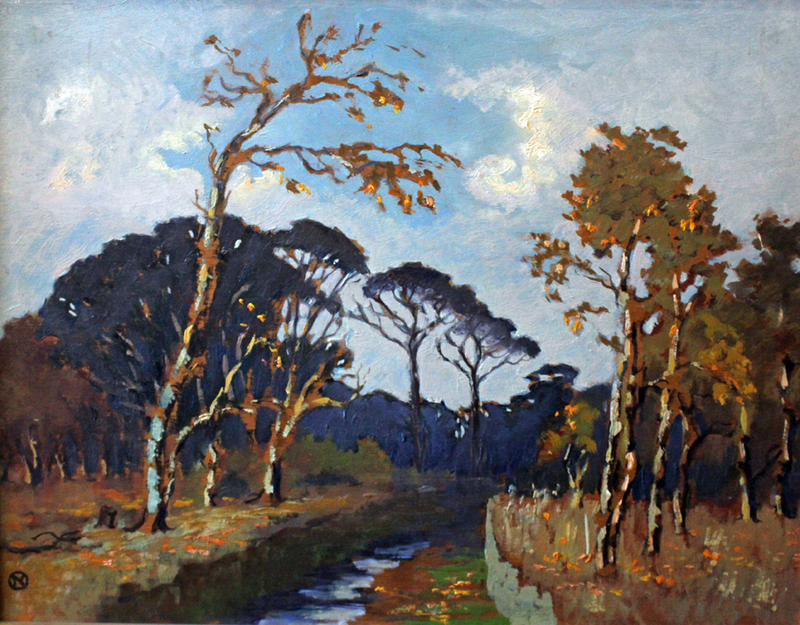 Evidence of her love for trees, and nature, can be seen in this portrayal of an Autumn landscape, with prominent trees along a partially dried up stream. 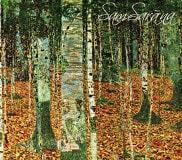 Rich tones, reminiscent of the colours of Autumn, portray the last clinging foliage, grassland and fallen leaves. Darker hues of blue and grey depicts the shadows and trees in the background, creating a sense of depth. The white, grey and blue area of the sky echo the pattern of the trees, combining colour with texture. The peeling bark of the trees is captured in thick layers of paint that evokes a sense of melancholy. The smooth flowing lines of the trees evoke feelings of loneliness and tranquility, testifying to the subtle changes in nature during the change of the season. Characteristic to her paintings, the linear accents of leafless trees stands out against the creamy texture of the brilliant blue sky. Creating the sense of clouds floating across the heavens during a lazy afternoon. In the 1950’s she painted her surroundings in the Jonkershoek Valley, progressively losing her eyesight until she was no longer able to continue. She passed away in Rondebosch in 1967. 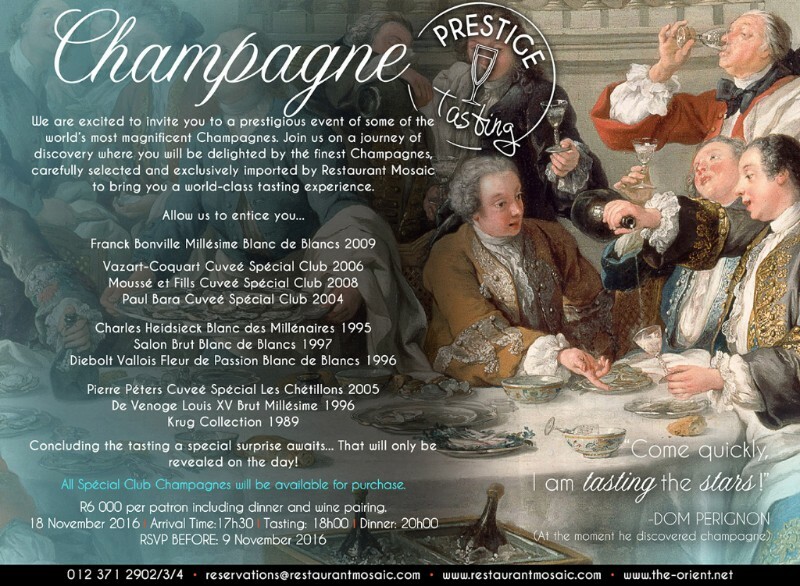 We are excited to invite you to a prestigious event of some of the world’s most magnificent Champagnes. 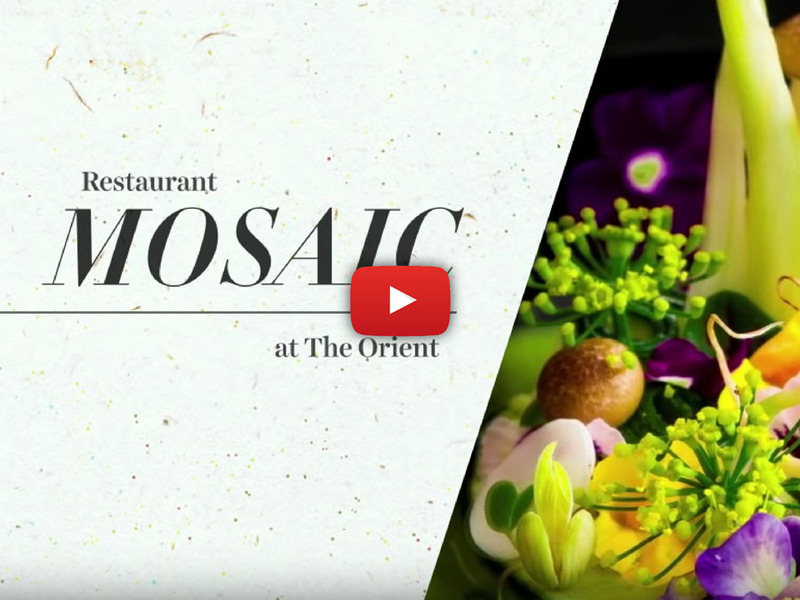 Join us on a journey of discovery where you will be delighted by thé finest Champagnes, carefully selected and exclusively imported by Restaurant Mosaic to bring you a world-class tasting experience. 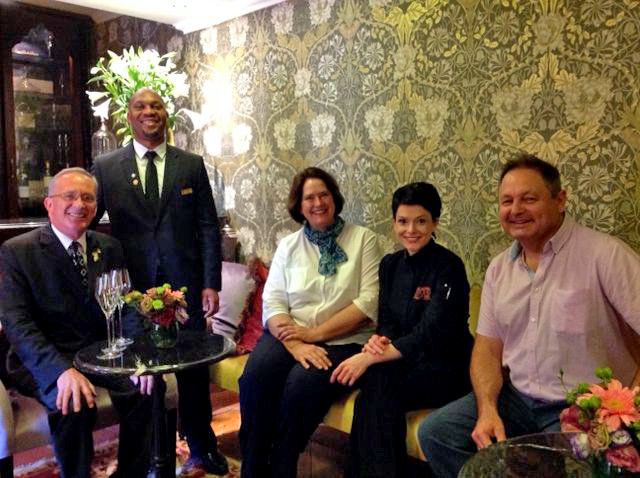 Concluding the tasting a special surprise awaits…that will only be revealed on the day! All Spécial Club Champagnes will be available for purchase. R6 000 per patron including dinner and wine pairing.